Former Maryland Gov. Martin O’Malley has a message for progressives clamoring for Sen. Elizabeth Warren’s entry into the presidential race: she’s not running, but I am. As part of an effort to position himself as the most viable candidate challenging Hillary Clinton from the left, O’Malley traveled to New York City Monday night for an off-the-record meeting with about 30 progressive influencers and academics handpicked to meet with him by his team, multiple sources told POLITICO. O’Malley asserted that he would be the best shot progressives have at truly challenging Clinton in a primary. “He went out of his way to mention the free trade deal,” which he — like Warren — opposes, said a source present at the meeting. Clinton, in contrast, has failed to state her position on the trade deal, which President Obama supports and union leaders would like her to oppose. O’Malley’s attempts to be the progressive alternative to Hillary Clinton are also complicated by the entry of Bernie Sanders in the race, with Sanders seeming to have caused greater excitement on the left than O’Malley so far. While there is the risk that the two could divide the progressive vote, I am hoping that there will be value in having both candidates criticizing Clinton’s conservative record and views in the primaries. While Clinton remains an overwhelming favorite, should both Sanders and O’Malley do better than is now expected, ultimately I would expect most delegates pledged to either working together to attempt to keep the Democrats from nominating Hillary Clinton. Many Democrats think that Clinton is a sure bet should she win the general election, but Nate Silver continues to think that Clinton has a 50:50 chance of winning, and warns that the “blue wall” which almost guarantees a Democratic victory is a myth. While Clinton currently leads in the polls, much of this is due to name recognition. Despite her recent small bounce, expected to occur after announcing, Clinton only maintains a small lead nationally over the Republicans in most polls, is weak in the battleground state polls, and is considered to be dishonest by the majority of voters–along with a substantial number of Democrats. There is far greater risk of a Clinton campaign self-destructing over both scandals and Clinton’s inability to handle the media than a more mainstream Democrat who wins in the primaries. Clinton continues to hide from the press, only having answered eight questions from the press since announcing her campaign, with most of these answers evasive. Her book tour, which should have been easy, was disastrous, and she couldn’t even handle an interview with Terry Gross on NPR. Her press conference after the email scandal broke was also a disaster, with fact checkers quickly reporting multiple false statements from Clinton. So far her campaign has consisted of staged events with hand-picked participants. This all predicts a candidate who will have difficulty expressing her views in a general election campaign. This is also likely suggestive of how she would govern considering her long-time hostility towards transparency in government. 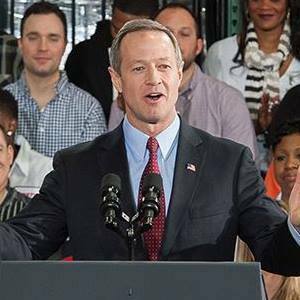 Update: O’Malley is now expected to announce his candidacy on May 30.